Sanitary Pad Making Social Enterprise -needs your support to sustain. Purulia district of West Bengal in India is among the most neglected and least developed part in India in these times of modern education and globalization. Adolescent girls and women here do not get to use sanitary pads during menstruation periods. Reasons are related to low awareness, availability and high cost. Instead they use unhygienic cloth pieces or nothing. The area being highly impoverished, this severely hinders girls’ and women’s participation in socio-economic outdoor activities for almost 15 days a month, leading to discontinued education, college, occupational engagement etc. and seldom leads to infections and complications. I am a University Qualified Social Worker. I lead an asset light NGO named Development Initiative that works in Purulia, Murshidabad and Sunderbans in the realms of education and livelihood besides working in Odisha. I have done 1st ever such survey in this area on awareness, usage, buying capacity, alternative means of selling etc related to locally made high quality sanitary pads. I am on a MISSION to create a STERILIZED SANITARY PAD MAKING SOCIAL ENTERPRISE to be run by an SHG (self help group) where pads will be made by women and girls, pads would be marketed by such girls, and we will supply to cater a population of 16,000 girls and women every month, 1st month onwards. It will be a self-sustaining model and we will expand the project with any additional income due to higher sales. The income will be distributed to participating women and some part will be channeled for maintenance and some expansion id feasible. 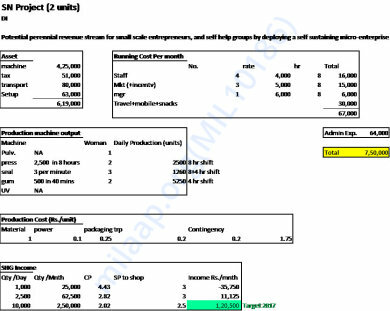 Attached is an actual estimate of costs and rough estimate of business and expected profit. We request you to support us in this noble cause for establishing this sanitary pad making unit that will improve women’s health, livelihood and economic competency. All donors will be provided progress report on Quarterly basis. PLEASE SHARE AMONG YOUR FRIENDS ON SOCIAL MEDIA. WE COMMIT TO YOU TO DELIVER AN HONEST PROJECT UTILIZING ALL FUNDS FOR THIS CAUSE.